The sleek styling of these precast concrete backless park benches will grace any setting. These concrete park benches feature a stylish contemporary look while maintaining the durability of steel reinforced concrete. These concrete benches require little to no maintenance. These benches will enhance the look of any high traffic area. 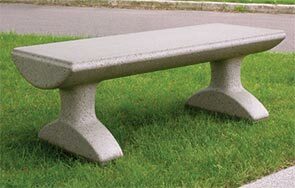 This concrete park bench is available in weatherstone concrete finish in the multiple colors shown below.